Uses: A very minor ore of antimony and as mineral specimens. Antimony does not often form in its elemental state and is far more common in sulfides and sulfosalts such as stibnite, tetrahedrite, bournonite, boulangerite and jamesonite. It is also found in some oxides such as valentinite, stibiconite and senarmontite Due to the abundance of these antimony bearing ores and the rarity of native antimony, it is never an important ore of itself. Native antimony is nearly indistinguishable from native arsenic. However the garlic odor which is sometimes found on arsenic specimens is not a characteristic of antimony and antimony does not tarnish as quickly or as severely as arsenic. Color is tin-white to a steel gray which can tarnish to darker grays. Luster is metallic but the tarnish will often dull the luster. Crystal Habits include pseudocubic rhombohedral crystals. More commonly found massive, botryoidal, lamellar and radiating. Cleavage is perfect in one direction (basal). Streak is tin-white to gray. 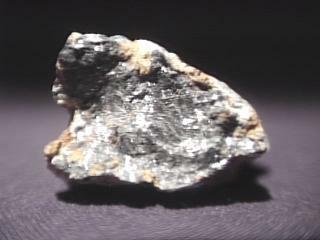 Associated Minerals include sphalerite, stibnite and nickeline. Other Characteristics: Does not have a garlic odor. Notable Natural Occurrences include Chihuahua, Mexico; Wolfe Co., Quebec, Canada and Kern Co., California, USA. Best Field Indicators are density, softness, color, crystal habits, lack of smell and associations.